Suspended over glowing embers, succulent slabs of meat are ready to be seared; the briquettes of charcoal creak as they expand with the heat and release smoky aromas that trickle down the meat, imparting gently burnt flavours to the food. Pitmaster or backyard wannabe, the barbecue chef has created magic, and is the hero of the day. Setting up a barbecue, especially an orthodox charcoal one, demands some care. Then, your patience is litmus-tested as it takes a fair bit of time for the meat to acquire that droolworthy crimson glow. But, barbecues run on a simple human philosophy: "It's better to have burnt and lost, then never to have barbecued at all." This might well have been another of the Bard's profound epiphanies. The most dramatic symbolism of American family life, barbecuing marks the onset of summer out west. Here in the Indian tropics though, balmy afternoon winds make it an early winter or an almost-spring activity, at least when you live up in the north. You can typically barbecue in three ways: over charcoal pieces, wood-fired grills and gas fired grills. In charcoal grilling, the buzzword is compressed hardwood pallets which are loaded into a hopper and then fed into a firebox at the bottom of the grill via a thermostat-controlled electric auger. These burn at anywhere between 37»-65» celsius on smoke mode and can be amped up to a maximum of 232» -260» C for searing tougher meat. Lava rocks are a good alternative to charcoal briquettes, if you find any available. Wood firing too is popular and fruit wood planks are the next big thing. Apple, apricot, plum, peach and nectarine are good for poultry and pork; citrus woods like lemon and orange give out moderate smoke that gives a light fruity flavour and is great for vegetables, fruits and fish. Fascinatingly, hard meats are also believed to attain a rich velvety depth when grilled over whisky barrel wood. Even the wood-fired oven, whose purpose of existence seemed limited to the growing popularity of bruschettas and pizzas, is great for roasting, grilling and baking. Finally, for amateurs, there's always the clean and convenient option of gas-fired barbecues or the even less messy electric induction ranges that also deliver good results. Indians may have drawn stylistic inferences from the west, but Mughlai cuisine is not new to the open flame method. Today, the sigri and the tandoor are being modified into top of the range grill systems making tikkas and kebabs a lot easier to whip up at home. While hand-me-down recipes and local techniques still do the rounds, contemporary chefs are laying out new rules for the game. Chef Ashish Rai, regional head at Barbeque Nation feels, "Foods with high starch content and firm texture like potatoes, carrots, sweet potatoes and pineapples are best suited for barbecuing. 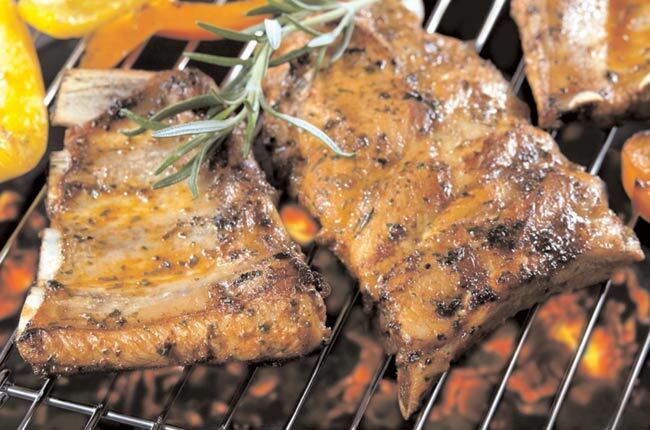 The trick to a good barbecue is controlled heat, pressure and constant marinating." Others like Nimish Bhatia, corporate executive chef at The Lalit Hotels shares two tips to a good barbecue. First, spray vinegar to open pores of raw meat and allow the flavours to infuse. Second, steer clear of frozen meat because only fresh and supple meat will absorb the marination. For chef Theodor Rudiferia, executive chef DoubleTree by Hilton, New Delhi, one must barbecue slightly less than the amount you want your meat cooked because you should always let the cut rest for 10 minutes. While resting, it is still cooking in its own flavours thanks to residual heat. Vegetarians too have ample options to play around with at the grill. The omnipresent cottage cheese chunks squashed between bell pepper and pink onion are outdated. Varieties of exotic cheese are the new craze. The Canadian Guernsey Girl cheese acquires a chewy pliability on the inside and retains a crunchy firm exterior despite the intense heat. Another great choice is a French Brie where the upper rind turns a golden brown while the rich milky inner turns gooey. For burgers and hot dogs, try a slice of camembert or cheddar. Blame it on popular American culture or just desperate taste buds, but a barbecue luncheon calls for a generous outpouring of beer, preferably the kind that wears a thick foamy crown. The full-bodied Sierra Nevada Pale Ale has hints of cinnamon and fruit whereas the rich golden Budweiser Budvar Dark Lager leaves trails of roasted coffee. Both are fitting tributes to a barbecue lunch. For the more Indian laal mas doused in its fiery hot spices, there's always the Thornbridge Jaipur India Pale Ale. Of course, you can always charm with wine. Uncork a Cabernet Sauvignon for medium grilled seafood and diced vegetables; or a Chardonnay or Zinfandel to go with a well-done lamb or pork steak. The spiced grapefruit notes of the Gewurztraminers or a Riesling pair well with pungent Indian fare. So, pat on the coal dust, get your palms greasy and let live cooking teach you that food, like life, is always about the experience.